Pace: You can complete this course at your own pace. Cancellation policy: Cancellations are not allowed. John Harricharan, International Speaker, Teacher, and Friend to All, Author of the Best-Seller, "When You Can Walk On Water, Take the Boat" & Dr. Steve G. Jones, Ed.D., Clinical Hypnotherapist, Board of Directors Member: American Lung Association (LA Chapter), Member: American Board of Hypnotherapy, Member: National Guild of Hypnotists • Founder: American Alliance of Hypnotists. Text Books (E-Book format):: As a bonus, you will receive the full transcription of the twenty 20-minute audio modules. This course is for anyone looking to master spiritual wealth to the level at which you can teach it to others and have them effectively attract spirituality and wealth into their lives. Even if you are a beginner with no prior success with harnessing spiritual wealth or perhaps are not interested in using the material to teach others, you should still take this course. You will learn everything you've ever wanted know about the spiritual wealth mastery and how to harness it's power to completely transform your life. 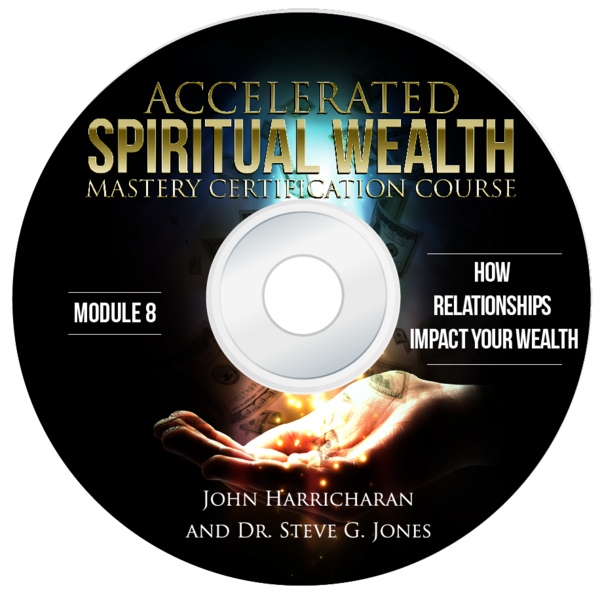 John Harricharan shares his empowering strategies and teaches you how to become a Spiritual Wealth Practitioner. Q: Will I need any other training in order to practice Spiritual Wealth besides your course? Q: Will I be properly trained if all I take is your online Accelerated Spiritual Wealth Mastery Certification Course? A: Ideally a Spiritual Wealth Practitioner would be trained in a classroom setting with an instructor physically present. Unfortunately, this luxury is not practical for many people. When we factor in airfare, hotel, time away from work and family, etc. the costs both monetary and otherwise quickly add up. For this reason, many institutions have turned to online training as a viable alternative to meeting modern day needs. In fact, Columbia, Harvard, and Cornell have extensive online programs. Also, Penn, Dartmouth, and Yale offer online classes. Dr. Steve G. Jones, Ed.D., while working on his doctorate in education, extensively studied the online programs offered by Ivy League schools. He then was able to take what he learned from those curriculum and combine it with John Harricharan's adept knowledge on Spiritual Wealth to create an Accelerated Spiritual Wealth Mastery program that offers a similar level of training. Additionally, in this course, you are encouraged to find a study partner and to learn with a number of people. Q: What about licensing requirements for Spiritual Wealth Practitioners. Are there any? A: At this time, to the best of our knowledge, there are no licensing requirements For Spiritual Wealth Practitioners anywhere in the World. However, if you start a business, you will generally need a business license. A: A 'Spiritual Wealth Practitioner' qualified by our standards to teach and practice the techniques involved in spiritual wealth. Q: What do I get when I buy the Accelerated Spiritual Wealth Mastery Course? A: You get instant access to all twenty 20-minute audio modules. AND as a bonus, we're including the full transcription of all 20 audio modules. A: It takes about 2-3 weeks if you listen to the modules, take notes and study the material. A: You must pass the test on the database with a score of 75% or better. If you fail you have a max of 3 times to pass. If you don't pass by the third attempt, you will be locked out of making other attempts for 2 months. You will also need to answer an essay question. Q: How long does it take to get my certifications? A: Once you pass the multiple-choice exam and submit your essay. Please allow 7 days for Dr. Steve to review your essay. You will then be notified by email whether you passed or failed. If you passed, you will be automatically added to the Global Sciences Foundation directory and you will be emailed a digital certificate. A: Upon completion of this program, you will receive a beautiful certificate sent via email, which you can print out and proudly display for your clients to see. 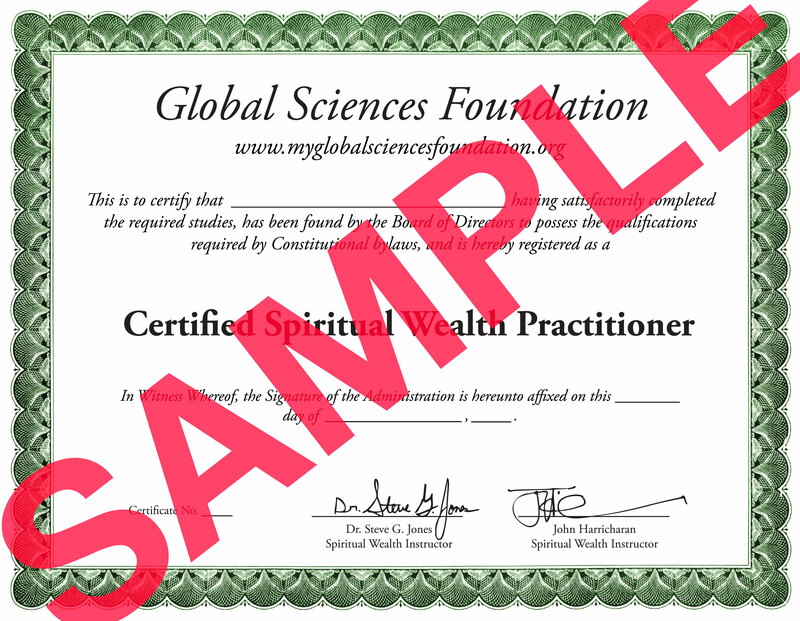 It will have your name, title (Spiritual Wealth Practitioner), date of certification and your certification number. A: The program is taught online by John Harricharan and Dr. Steve G. Jones, Ed.D..
Q: What are Dr. Joe Vitale and Mathew Dixon's qualifications as instructors? A: Outstanding businessman, lecturer and award-winning author, John Harricharan, is a unique blend of East and West. A naturalized U.S. citizen born in Guyana, South America of East Indian heritage, he is truly a multi-cultural, global personality. Yet, with his professional background, he also exhibits a rare sensitivity and charismatic delivery, which have earned him well deserved respect and acclaim. However, he was to know failure as well as success. The events that led to both are incorporated in his lectures and are chronicled in his books, which, rather than being stories of loss and sadness are, instead, inspiring tales of courage, strength and the dignity of the human spirit. He has shared the lecture platform with such well-known speakers as Deepak Chopra, Elisabeth Kubler-Ross, Og Mandino, Gerald Jampolsky, Foster Hibbard, Eric Butterworth, C. Everett Koop and others. His transformational message stems from his challenging personal growth experiences. As Harricharan says, "I know what it feels like to have my car repossessed, to watch my wife die of cancer, to lose all earthly possessions and start again from ground zero. I also know what it feels like to write an award-winning book, to be written about in others' books and to be featured in the same book with His Royal Highness, Prince Philip of Great Britain, the Dalai Lama and Paul and Linda McCartney. The contrasts bring compassion and sensitivity to one's life and living." Dr. Steve G. Jones, Ed.D. has over 20 years experience as a certified clinical hypnotist, both teaching hypnosis students and working with clients. His list of former clients includes: Danny Bonaduce, Jeraldine Saunders (creator of the Love Boat TV series), Tom Mankiewicz (writer of Superman the movie), and many other celebrities. Steve has served on the board of directors of the American Lung Association in Los Angeles, California. He is a member of the National Guild of Hypnotists, National Board of Certified Clinical Hypnotists, founder of the American Alliance of Hypnotists, member of the International Registry of Clinical Hypnotists, has presented his hypnosis research at the American Council of Hypnotists Examiners, received the President's appreciation award for his outstanding contributions to the American Association for Adult and Continuing Education, is a member of the American Board of Hypnosis, member of Who's Who among Students in American Universities and Colleges, member of Pi Lambda Theta International Honor Society and Professional Association in Education, member of Omicron Delta Kappa Honor Society, member of the Golden Key Honor Society, recipient of the National Leadership Award from the United States National Congressional Committee, received a bachelor's degree in psychology from the University of Florida, received a master's degree in education from Armstrong Atlantic and State University, received the educational specialist degree from Georgia Southern University, and is currently a doctoral candidate in education at Georgia Southern University. Steve has recently been featured on TruTV, CNN, and is under a development contract for his new television series on hypnosis. Q: Do I need an advanced degree to practice Spiritual Wealth, such as a bachelor's degree or a master's degree? A: Yes. 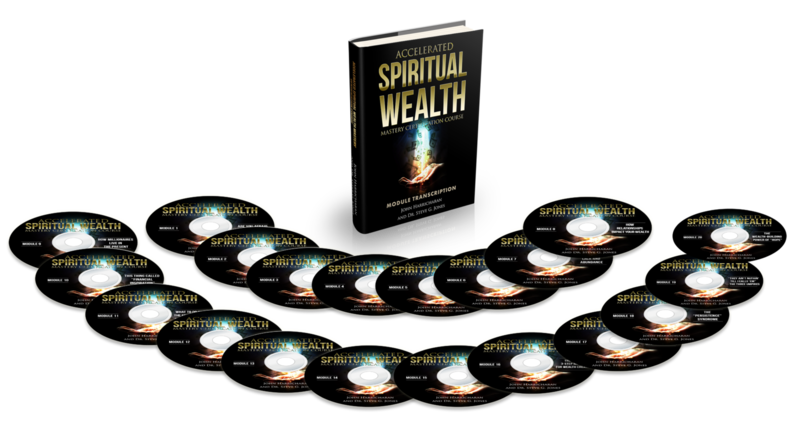 You will be listed on the international online list of Spiritual Wealth Practitioners. Q: I am a layman with no Spiritual Wealth background. Will this program actually take me from the ground floor up and teach me everything I need? A: Yes. This program is extremely thorough and it will teach you everything you need to know to be a certified Spiritual Wealth Practitioner and help you run your own practice. Upon registering, you will receive email instructions on where to go online to access thecourse. You can work at your own pace. What is the Spiritual Wealth Mastery, and how does it benefit you? This home based course, is designed to be a resource for you for the rest of your life, to teach you what Spiritual Wealth is and how to effectively use it to improve your life and the lives of others. You will learn valuable tools for harnessing the power of the Spiritual wealth as well as unique tools for life in this intensive, power-packed course. With the online training program you can study at your own pace and you are not tied to a specific training schedule. If Accelerated Spiritual Wealth Mastery enables rapid positive change, why not learn rapidly? Have fun, expand your awareness, and experience deep positive change on extremely rapid levels. Module 1: Are you Afraid of Being Rich? 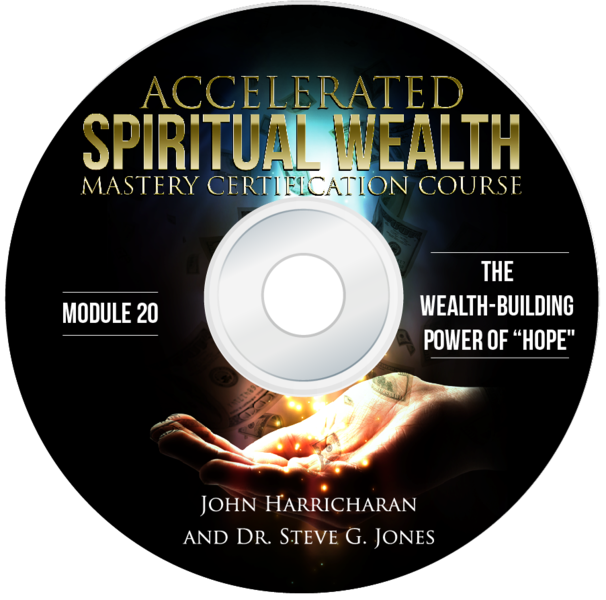 Module 10: This Thing Called "Financial Inspiration"
Module 20: The Wealth-Building Power of "Hope"